Buzz Aldrin, and Neil Armstrong reflected in his helmet, during the moon landing in 1969. NASA turns 60 years old today (Oct. 1), and while the agency has been particularly focused on its past in anticipation of the big milestone, that's business as usual for a little-known office within NASA. In fact, NASA's history office is just a few months younger than the agency itself and was created to help the agency share its work with the public. It's one of many such offices within the federal government, albeit perhaps one with the most engaging history to curate. He said there's no question that NASA's history has been used in all sorts of ways. Take the images astronauts snapped during the Apollo missions as an example, he said. "I would contend that those images have a resonance and a meaning that's far beyond the time and place in which they were created," even inspiring MTV's logo, Launius said. But they have also become fodder for moon landing deniers, whether motivated by ignorance, disbelief or malice. Launius said that the biggest change during his tenure was in the tools the office could draw on, increasingly relying on transcription software, for instance. And of course, as the internet seeped into homes, NASA as a whole jumped on board. NASA built its first web pages in the early and mid-1990s, and the history office did as well. The process has only continued after his departure. "The social media piece of this has become more important over time too, and I would really contend that that has been a fundamental shift," Launius said. But while anyone can visit the history office online or in person, it also caters to professional historians. And for NASA programs particularly, the office is invaluable. 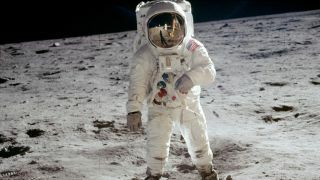 "You can find really incredible stuff and things that have been lost to the sands of time," Lisa Ruth Rand, a historian of science, technology and the environment who is the American Historical Association and NASA fellow in space history, told Space.com. "That's why archives are so fascinating and necessary." History isn't just a fun hobby: Better understanding NASA's past can help us accurately evaluate the present and future of space exploration, Launius and Rand agreed. "One of the things that we found over and over again is the arc of history doesn't really change, it continues on, and stuff doesn't really come out of the blue," Launius said. "That's what any history program is all about." Launius said that NASA's history can also reframe our perspective of the rise of commercial companies like SpaceX and Blue Origin as a new phenomenon. "That, of course, is baloney," Launius said, pointing to a long history of space-focused entrepreneurial entities becoming government contractors. "If you want to say Elon's done something nobody's ever done before, that's just not true." History is also where we rediscover people and events that society has simply forgotten about, whether purposefully or accidentally, Rand said, pointing to rediscoveries like that of the African- American women who worked as human computers at NASA during the 1950s and 1960s and have now been dubbed "hidden figures." Digging through historical records, she said, "allows us to continue to build that consensus and revise it and have a stronger sense of what happened in the past." In particular, Launius said, we have a lot to learn from what is perhaps NASA's best-known endeavor — the Apollo missions that put humans on the moon. He noted that several people involved with the program later said it was much harder than they had expected. And history shows how public opinion of the project has changed over the intervening decades. 'There's a belief that everybody loved Apollo, and they didn't," Launius said, adding that the only time half of surveyed Americans said the mission was worth the money was in 1969, the year of the first landing. "It's not that people object to the idea, it's that they object to spending their hard-earned tax dollars on it." He added that the Apollo missions, like any others, were born in a specific context that shaped how they unfurled: prompted by a wish to prove the U.S. stronger than the Soviet Union. NASA may have goals just as vast today, but a similar geopolitical impulse may not show up in time. "We keep talking about going to Mars and that's great; I don't think there's anybody in the space community who doesn't think that would be a good thing to do, but we've always run aground on this politically," Launius said. "If you're willing to accept that there's a trigger mechanism, a geopolitical crisis that caused Apollo, what is the geopolitical crisis that's going to spark a return to the moon or more importantly a trip to Mars?" Launius added that a key audience for the history office is decision-makers who want to ground their actions in lessons learned from the past. But that might not be happening enough, Rand said, wishing governmental and commercial space leaders would stop by the NASA history office more often. "It can only be a valuable thing to have a better backstory so you don't constantly reinvent the wheel over and over again," she said.